Description of the coffee truck that we have for sale is below. If you want to see more pictures, please use the navigation above to go to "The Truck" page or click here. -Truck only has around 32,000 miles runs perfect-needs nothing. Just passed state inspection. The generator is designed/integrated into the van. It draws air in through the sliding door on the driver's side and expels the air out through the bottom of the truck (you may be able to see 2 little black vents on the lower half of the door in the pics). The gas is fed to the generator through a Cummins onan brand pump drawing off the actual truck's factory gas tank. It was professionally tapped into so that the generator will "run out of gas" and shut dow when the truck's gas tank is at 1/4 tank. This way you don't strand yourself by running the truck dry from the generator usage; similar to how they do it in an RV for the same reason. 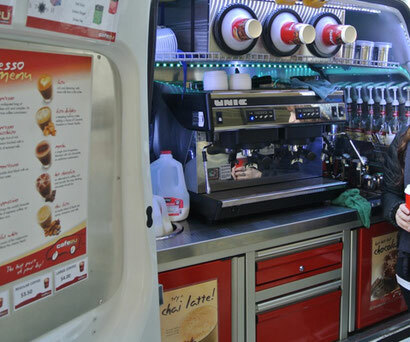 This coffee truck holds a ton of product when fully stocked and has capabilities of a full functioning brick and mortar coffee shop. 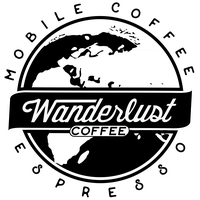 The look of the coffee truck that we are selling when it was fully stocked! We have cleaned it out and it is ready for your own look and stuff! We ARE including some steam pitchers, shot glasses, rags, some blank white cups if you want them, cash drawer insert, syrup pumps, a 50 amp shore power extension cord, and a handfull of other things that will get you on your way! We will also consider including training to an out of state buyer at the right price.